The latest entry-level treadmill by ProForm is the Performance 400c. It has a 55″ track and 300-pound weight capacity for users. So it is best for people who are not too heavy who jog and walk. We have different ProForm treadmill reviews for individuals who need to have a longer track for their specific running strides and/or who weigh more. The inexpensive 400c treadmill comes with 18 built-in workouts. An iFit Live module can be added for around $99 in order to access exercise advice, personalize workouts and other online interactive features. Workout Programs: 18 built-in workouts that target distance, speed and calorie-burn goals. In addition, the 400c treadmill has been wired to accommodate the very popular iFit Live! Your home wireless Internet connection can be used for logging into iFit via the treadmill’s console to run alongside trails “Powered by Google Maps” that you design, workout to Jillian Michaels from the Biggest Loser, and overall enhance your treadmill workouts. Automatic incline: This feature helps you quickly burn calories and target various muscle groups. All you need to do is push a button to tilt the track to up to 10% grade. When the iFit workouts or preset apps are used, it adjusts automatically. Note: Most other inexpensive treadmills come with a manual incline. SpaceSaver design: In order to free floor space up, tilt the deck up when you are not using the treadmill. This is easy to do with the shock-assist technology. Track cushioning: For an inexpensive treadmill, the cushioning is not so bad. Compared to exercising on pavement, the ProShox cushioning helps to reduce joint stress by as much as 28%. Dual grip heart monitor: The handlebars include pulse sensors. The data is still useful even though wireless monitors are more accurate. You can maximize your time by tracking your heart rate as you exercise. Audio: Stream the latest podcast or your favorite music. The ProForm 400c is able to play MP3s via the Intermix Acoustics 2.0 speakers. Multi-window console: There are several data windows that show calories burned, time, speed and other statistics. Workout fan: keep cool while working out with the two-speed fan. Warranty package: The treadmill comes with a one year warranty on labor and parts, 25-year motor warranty and lifetime frame warranty. Track length: The track on this treadmill is fairly short. The 55″ x 20″ measurement makes it best for runners or walkers who have short strides. Motor: Despite the fact that it has a long warranty, customer reviews do suggest that the ProForm 2.75 CHP motor really only supports jogging and walking; operation isn’t all that smooth beyond that. See our other ProForm treadmill reviews for machines with lifetime warranties and more powerful motors. The ProForm Performance 400c is an okay option for moderate and beginner exercisers. It isn’t designed for running- the motor isn’t that powerful and it has a short track. However, it you are wanting to walk to become fit then it can definitely help. With an incline, 18 built-in workouts and iFit Live compatibility, improving your physical fitness is practically guaranteed. However, if you have more money to spend for more capabilities and better parts, consider the ProForm Performance 1450. It features a touch screen, advanced cushioning, 60″ track and other upgrades. 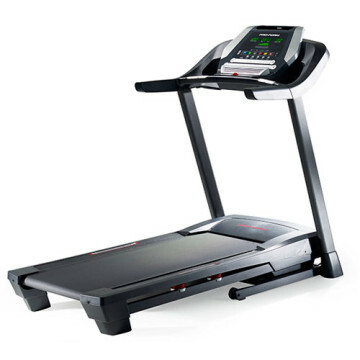 We also recommend NordicTrack and Sole treadmills in this price range.